May the Lord shower choicest blessings..! Delighted to send my greetings and congratulation to dearest, Emmanuel Cecil Sandrasegara of Mathagal, Jaffna, born on January 24, 1918, gifted and blessed to celebrate his unique journey reaching one-hundredth birthday. The centenary was celebrated on January 24, 2018, in Colombo. All his beloved children, grandchildren, great-grandchildren, relatives and friends from abroad celebrated the god gifted precious day at the Mount Lavinia Hotel, Sri Lanka. Late Mr Muthiah Sandrasegara and late Mrs Victoria Chellammah Sandrasegara were orthodox Catholic parents of Mathagal and were blessed with four sons and two daughters. Emmanuel as the third chubby and fair son in the family enjoyed the love and affection of all and became the pet of all. 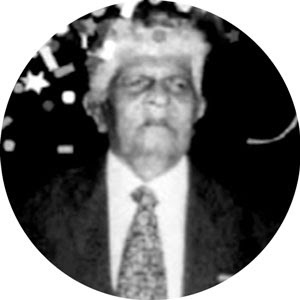 After completing his secondary education at St Henry’s College, Illavalai Emmanuel joined the Bank of Ceylon very early in life and served with exemplary records and retired in September 1976 after serving his full term. His honesty, punctuality and hard work appreciated by his Superiors enriched with promotions and he received the highest respects from his colleagues and juniors. Mathagal is a village in the Jaffna Diocese, where St Joseph Vaz preached the Word of God and converted many to Christianity. The Catholic inhabitants built a church in honour of St Anthony and invoked his blessings. Emmanuel having inherited his faith in God from his parents became deeply religious in his faith and in St Anthony Patron of Mathagal. Cecil Emmanuel better known as Sinnathamby in Mathagal and among his relatives cherished a long fruitful life by the graceful blessings of Saint Anthony. Emmanuel married Mangiairkarasy and both were blessed with one daughter Ratneswary and two sons Raveendran and Pullen ran. Being a devoted husband and affectionate father, educated his children and brought them up in the fear of God, instilled in them noble qualities to blossom in their lives. A man of sound character with virtuous qualities ever cheerful with pleasant and charm disposition, greeting everyone with his radiant smile. He is always there to serve others voluntarily in their needs and never spoke harsh words or ill of others. Very talented to entertain his friends with witty jokes and laughter by relating their family history and spirits up all at parties even being a teetotaler. His priority in life is to attend all weddings when invited and to be there always for all the funerals of friends, relatives, and every known person in the village. His life was not that rosy. He lost his beloved wife Mangai and his daughter Ratnes but his faith in God and St Anthony sustained him in all his trials and triumphs. The Late Augustine Sandrasegara, the elder brother of Emmanuel, who was working as Govt. Officer in Kayts often visited our home in Karampon to renew the family relationship with my mother Thangarasam Soosaipillai. In fact, his mother late Mrs Chellammah Sandrasegera called Akka by my mother brought the marriage proposal for my sister Clinett to Dr Joe Peter from Green Shade, Mathagal and he became my bro-in-law. As an Extraordinary Eucharistic Minister of Holy Communion from St Lawrence’s Parish, I was privileged to visit Emmanuel at the Elders Home in Wellawatte and offer him to receive Holy Communion on 1st Fridays. May Lord Almighty shower choicest Blessings on Emmanuel and grace him Good Health and Long life.